The sweet scent of apples baking wafts through the cabin’s open door. Smoke rises slowly from the chimney against the clear blue sky. Inside, Emily pokes and prods the fire in the stove, willing its flames to life with anticipation of a perfectly baked pie. Wooden floorboards creak as she takes the few steps across the room to the door. She peers out, and a smile spreads across her face as she spies her little sister, Sophia, tromping around on stilts, stirring up dust and causing the chickens to cluck noisily. Just then, Mrs. Miller emerges from the root cellar where she’s just taken a bounty of potatoes harvested from the garden. She wipes her hands on her apron and her brow with her sleeve and looks around. She takes a moment to survey her family ranch, quietly contemplating the list of chores needing to be tended to on this brisk fall day. Mrs. Miller smiles at Emily, her son’s wife, before heading off toward the chicken coop to collect the day’s eggs. Life on the 1904 homestead can be demanding, yet it’s also fulfilling and punctuated with laughter and love. The Millers had humble beginnings, but they feel rich in land, land where the family’s cattle graze, tended to each day by Mr. Miller and his son, Emily’s husband. 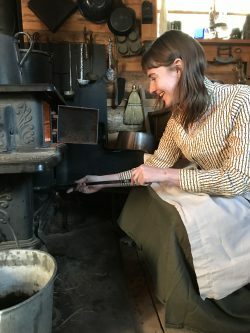 The characters who bring the Miller Family Ranch to life for High Desert Museum visitors are each created with an attention to detail that enables them to completely immerse themselves in the historical world they are living in. Creating and successfully portraying a first-person character means presenting the persona as though from the past and without context to the present. 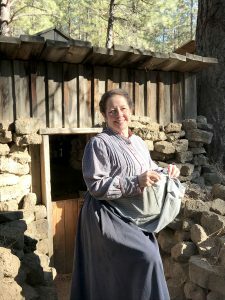 “You really have to get to know the person,” explained Linda Evans, the Museum’s curator of living history who portrays Mrs. Miller. Getting to know someone who never really existed, however, is much different than getting to know someone you can actually talk to. It takes months of research and is an ongoing journey of discovery. While Mrs. Miller is a fictional character, she is based on the lives of two very real women with very different perspectives and experiences as homesteaders in the late 1800s and early 1900s. Linda dedicated herself to learning as much about each of them as she could, studying diary entries and letters written back and forth with family back East. Through their own words, the two women lent emotional insight into what it meant to face the trials and triumphs of everyday life, working to survive and prosper in the Old West. To add depth to any living history character there has to be a genuine sense of place. This involves much more than merely setting a stage, however. It’s important that Mrs. Miller understand the world she’s living in and how it impacts her life personally — to familiarize herself with topics such as politics, geography, agriculture and industry. Often, the questions visitors ask require characters to have a personal timeline complete with important historical dates and dates marking personal milestones such as marriage and the birth of children or events such as moving to a new location. Mrs. Miller, who was born in 1845, traveled west with her family on the Oregon Trail when she was just 10 years old. She grew up near Salem and later fell in love with Mr. Miller. Together they moved to Central Oregon in 1881, pursuing the promise of free land. They established their homestead and ranch in 1882. Creating a timeline such as this provides a sense of place in the world and a personal history and perspective. The characters at the ranch work to get to know one another. They explore their emotional connections in order to determine historical relationships within the context of the setting. 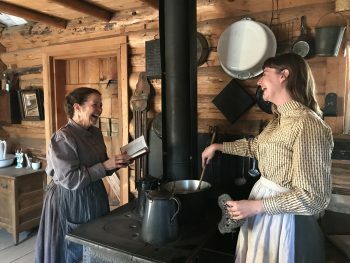 Living history interpreter Emily Agan, who plays Mrs. Miller’s daughter-in-law at the ranch, developed a playful bond with teen volunteer, Sophia, lending a natural connection that helped define their characters’ relationship. The two saw themselves as sisters, which fit not only the ranch’s timeline, but also the storyline at play. Not wanting to wait with idle hands for her pie to be ready, Emily grabs a broom and begins to sweep the cabin’s porch. 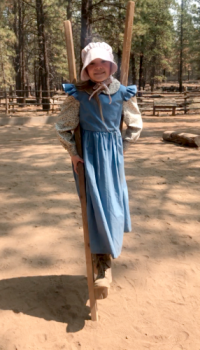 Across the way, Sophia leans her stilts against a large ponderosa pine and joins Mrs. Miller at the chicken coop. They collect eggs that they will boil and pickle, ensuring they’ll last the long winter ahead. 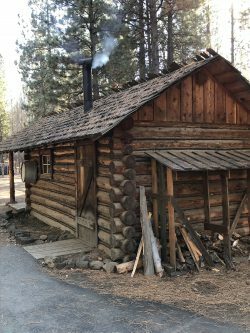 Mrs. Miller has a broad smile on her face when, at last, she settles into the wooden rocking chair just outside the cabin door. Sophia settles on the porch next to her. Inside, Emily dishes up three pieces of warm apple pie, a welcome end to a long day on the ranch.